Sergio Perez says he has recovered completely after a stomach virus affected his weekend in Malaysia. 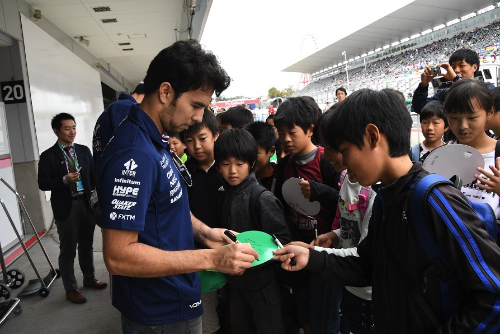 Photos emerged of the Force India driver attached to an IV after Saturday and Sunday's events at Sepang, and the Mexican said in Japan on Thursday: "It was so bad in qualifying that I had to rush to the toilet at one point." But Perez explained: "I feel completely healthy now. I'm 100 per cent ready for this weekend." The 27-year-old has been signed up by Force India for another season, but Perez thinks hanging onto fourth place in the constructors' championship will be hard for the team in 2018. "Next year will be very difficult, but I'm sure that he will be one of the contenders for fourth place," said Perez. "I think McLaren will be a greater threat to us than Renault," he added. "But we have been working on the car for next season for a long time already, so it should be very competitive."